arthouse.nyc presents LIGHT: We live in times when need enlightenment more than ever to give us hope. Join us as we flood our walls with the inspiration of 40 international artists. We will start with a digital exhibit in NYC at GrowNYC 's Project Farmhouse and then take the top selected images to Miami to be exhibited at Red Dot in Wynwood during Miami Art Week. This upcoming exhibition is a fundraiser for New Light Congregation in Pittsburgh, PA. On 10/27/18, the synagogue was affected by the recent mass shooting at Tree of Life. There are 3 congregations that operated in the Tree of Life Building -New Light is one of them and conducts services on the lower level of the building. My brother was in the building at the time of the shooting. Miraculously he survived, however, as you may already know, 11 innocent souls did not. 3 of the 11 were the pillars of New Light Congregation - - Daniel Stein, Richard Gottfried and Melvin Wax as they were generous men who ran and volunteered for everything. Without their assistance, the future of New Light Congregation is on shaky ground. I know that each one of these men would have wanted New Light to continue shining. It is a mere coincidence that the theme of this exhibition is LIGHT - it also the first night Hanukah and we welcome one and all. 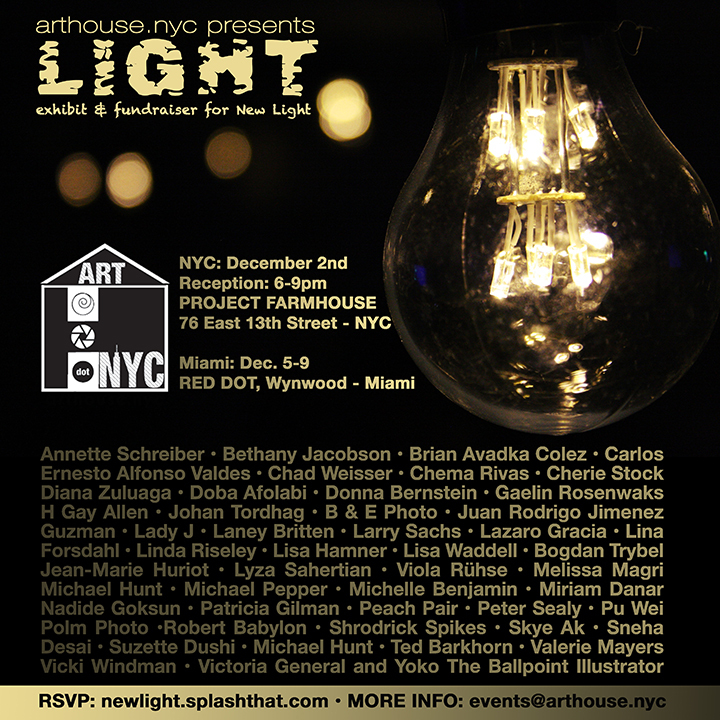 ARTHOUSE.NYC is proud to partnered with Project Farmhouse to bring this very special exhibition to light. Our exhibitions regularly feature artists from around the world - all six continents are consistently represented in one show. At ARTHOUSE.NYC we pride ourselves for consistently reaching around the world to welcome and exhibit artists from all walks of life so that we may recognize and appreciate their beautiful and diverse perspective. Conceived in one of the best contemporary and cutting edge digital art galleries in New York City, ARTHOUSE.NYC is an event producing agent devoted to all things artistic, colorful and quintessential New York. We specialize in creating a home for emerging artists as well as season professionals. In addition, we are also NYC’s favorite event space for fundraisers, art galleries/fairs, photography exhibitions and unique experiential events. ARTHOUSE.NYC has hosted a variety of exhibits and launches, including Smile Train, Global Fund For Widows, Land Art Generator Initiative, International Center for Photography, Wings World Quest, Lynn Planned Parenthood and Charles & Lynn Schusterman Foundation. CAN'T MAKE IT TO THE SHOW AND STILL WANT TO CONTRIBUTE?